Good news for Kornheiser haters! Tony is officially stepping down as third man in the "Monday Night Football" booth. The slightly more exciting (upsetting? baffling?) 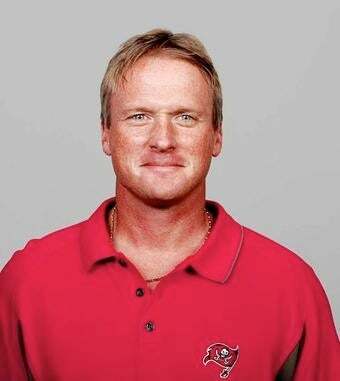 news is that Lil' Jon Gruden will take his seat. Gruden, who lost his defensive coordinator to Baby Boy Lane, then lost his job running the Tampa Bay Buccaneers, has found a new career—listening to Ron Jaworski explain the mechanics of three-step drops. It shouldn't take longer than three or four weeks of lousy MNF blowouts before Gruden will probably do something scumbaggy and Mike Tirico will stare wistfully off into the distance as he imagines what life would have been like if he'd stayed with the circus like his parents wanted. Carnies never judge. Of course, we all know that Gruden is just biding his time until next summer when it's finally revealed which NFL team has drafted the toughest quarterback who ever lived. Jon will then arrange for the "extradition" of that team's head coach, taking his place as mentor and idolater of The Tebow. Then he'll be replaced in the booth by Cody Gifford and the circle will be complete.